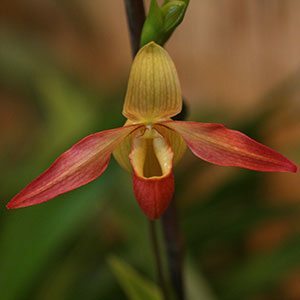 With just over 20 species in the genus, Phragmipedium Orchids are a Slipper Orchid and are widely grown and hybridised. Although they are from South America they do grow at elevations so are easy to grow. It is mainly the hybrids that are seen for sale although the species themselves are sought after by collectors. They come in a range of colours and do require slightly different temperatures. They will grow in a range of potting mediums however need to flushed out with clean water on a regular basis. Watering regime is important, always use water that is at room temperature rather then straight from a tap. This allows the water to rid itself of some of the chlorine. Rain water is best and deep watering is most successful. In general more frequent water will be required in summer, usually daily. It is also important not to water the foliage as this can cause damage. Different species require slightly drier conditions such as caudatum, besseae and wallisii. Filtered light is essential, around 50 % to 75% shade cloth depending on climate is an indication. Light should always be filtered, with to little light they tend not to flower. Good air flow is essential, however not cold wind. Humidity should be at around 60% and a saucer full of pebbles with water that the pot can sit on can help achieve this. Misters and foggers can also be used in summer if required. Use a pellet form organic fertiliser such as Strike Back when repotting. A diluted liquid fertiliser can be used every second week when in active growth. Make sure that a good watering between fertiliser application is carried to to flush away residual salts.. Ensure that you do not over pot, and repot every 2 years at least to avoid the potting medium breaking down. 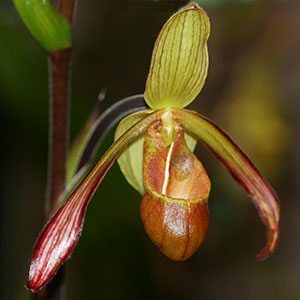 Try to use a deep pot as these orchids like to send their roots downward.